Did St. Paddy’s Day celebrations get your wallet feeling a little empty inside? As many a starving student may know, going out to drink can get pricey, especially when you’re the kind of person to celebrate on days that end in -Y. Whether you are that person or just someone who enjoys a nice drink to wind down, knowing how to prepare your own drinks is a skill that can be useful for almost everyone. Mixologist is a handy app, chock full of drink recipes, tips and tricks and other features that can help you become that amateur bartender you’ve always dreamed of being. Released by Digital Outcrop, Mixologist is extremely well-organized. It contains over 7,900 recipes and 1,300 ingredients that you can browse or search through. Drink recipes are also searchable by category so you can easily find all the different cocktails, shooters or even jello shots there are. Another incredibly useful feature is its Liquor Cabinet, which allows you to find the drinks you can make based on what liquor and mixers you currently have on hand. There is also a random recipe finder as well as a fairly thorough bartending guide, which provides everything from common terminology and description of the various glassware and tools of the trade to tips on stocking your bar and preparing your drinks. For the experimental, there is also a “Custom Drinks” feature that lets you enter your own personal recipes. Surprisingly, Mixologist can also be found for free under the name Mixology: Drink Recipes. This free but ad-supported version has the complete database of Mixologist, with only a few small differences, like having less ways to get a random drink and no Custom Drinks feature. All-in-all, Mixologist: Drink Recipes is an app that I found to be impressively thorough and well-done. Considering its $0.99 pricetag, I didn’t mind choosing this over Mixology to get it ad-free, along with the useful Custom Drinks feature. You can find both in the AppStore today. 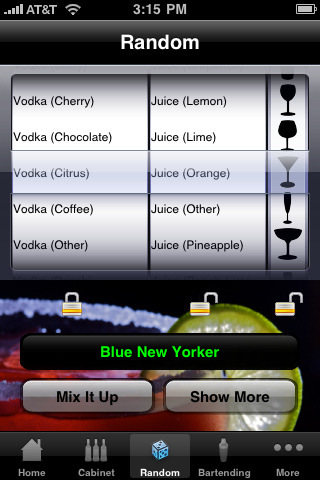 AppSafari review of Mixologist: Drink Recipes was written by Aucoeur Ngo on March 18th, 2010 and categorized under App Store, Food, Free, Fun, Reference, Search. Page viewed 5379 times, 2 so far today. Need help on using these apps? Please read the Help Page.